Eliminating waste from the industrial chain by reusing materials to the maximum extent possible promises production cost savings and less resource dependence. However, this report argues that the benefits of a circular economy are not merely operational but strategic, not just for industry but also for customers, and serve as sources of both efficiency and innovation. Economies will benefit from substantial net material savings, mitigation of volatility and supply risks, drivers for innovation and job creation, improved land productivity and soil health, and long-term resilience of the economy. The second report looked at fast-moving consumer goods (FCMG), this time at the global level. 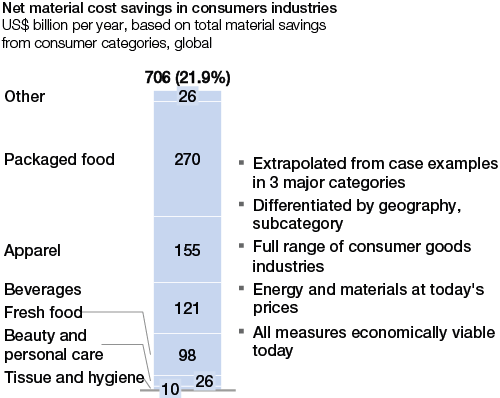 The full value of the circular opportunities, globally, could be as much as US$ 700 billion per annum in materials savings, or a recurrent 1.1% of 2010 GDP, all net of materials used in the reverse-cycle processes [Figure 6].22 Those materials savings would represent about 20% of the materials input costs incurred by the consumer goods industry. Innovation. The aspiration to replace one-way products with goods that are ‘circular by design’ and create reverse logistics networks and other systems to support the circular economy is a powerful spur to new ideas. Adopting more circular business models would bring significant benefits, including improved innovation across the economy [Figure 7]. It is already proving a vibrant terrain for entrepreneurs who target the benefits of an economy that operates with higher rates of technological development; improved materials, labour, and energy efficiency, and more profit opportunities for resource-productive companies. Job creation potential. The effects of a more circular industrial model on the structure and vitality of labour markets still needs to be explored. 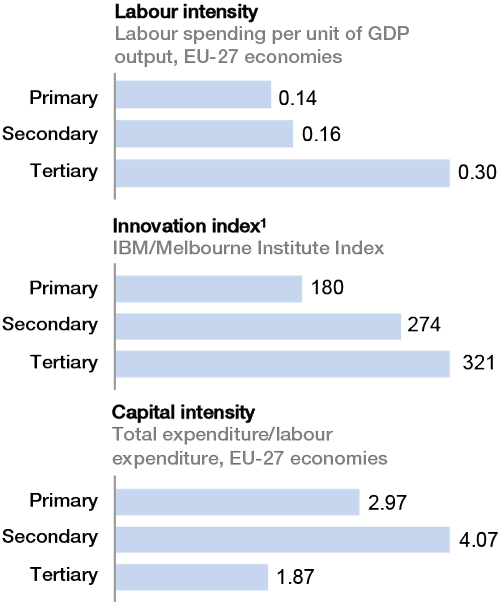 It seems likely that the effects will depend on the way these labour markets will be organized and regulated, and yet: there are signs that a circular economy might bring greater local employment, especially in entry-level and semi-skilled jobs, which would address a serious issue facing the economies of developed countries [see Figure 7]. This total prize is just the beginning of a much bigger set of transformative value-creation plays as the world scales up the new circular technologies and business models. We already see a selective ‘grafting’ of new circular business models and technologies during this period of transition. Initially, these grafts may appear modest in their impact and play into niche markets (e.g. growing greenhouse tomatoes, or hiring out high-end fashion items). But over the next 15 years these new business models will likely gain an increasing competitive advantage because they inherently create much more value from each unit of resource. They are also likely to meet other market requirements associated with a more secure supply, more convenience for consumers and lower environmental costs. In a world of circa 9 billion people and fierce competition for resources, market forces are likely to favour those models that best combine specialized knowledge and cross-sector collaboration to create the most value per unit of resource over linear models that simply rely on ever more resource extraction and throughput. Natural selection will likely favour the swift and agile players—able to quickly combine circularity with scale—that are best adapted to a planet transformed by humanity. Land productivity and soil health. Land degradation costs an estimated US$ 40 billion annually worldwide, without taking into account the hidden costs of increased fertilizer use, loss of biodiversity and loss of unique landscapes. Higher land productivity, less waste in the food value chain and the return of nutrients to the soil will enhance the value of land and soil as assets. The circular economy, by moving much more biological material through the anaerobic digestion or composting process and back into the soil, will reduce the need for replenishment with additional nutrients. This is the principle of regeneration at work. Lasting benefits for a more resilient economy. Importantly, any increase in materials productivity is likely to have a positive impact on economic development beyond the effects of circularity on specific sectors. Circularity as a ‘rethinking device’ has proved to be a powerful new frame, capable of sparking creative solutions and stimulating innovation. The circular approach offers developed economies an avenue to resilient growth, a systemic answer to reducing dependency on resource markets, and a means of reducing exposure to resource price shocks as well as societal and environmental ‘externality’ costs that are not picked up by companies. A circular economy would shift the economic balance away from energy-intensive materials and primary extraction. It would create a new sector dedicated to reverse cycle activities for reuse, refurbishing, remanufacturing or recycling on the technical side, and anaerobic digestion, composting and cascading on the biological side. At the same time, emerging market economies can benefit from the fact that they are not as ‘locked in’ in the linear model as advanced economies are and therefore have the chance to leapfrog straight into establishing circular setups when building up their manufacturing-based sectors. Indeed, many emerging market economies are also more materials intensive than typical advanced economies, and could therefore expect even greater relative savings from circular business models. The circular economy will generate benefits for stakeholders on every level—customers, businesses, and society as a whole. 21 See note 1 above. 22 Towards the Circular Economy 2: Opportunities for the consumer goods sector, January 2013, Cowes, Isle of Wight: Ellen MacArthur Foundation. 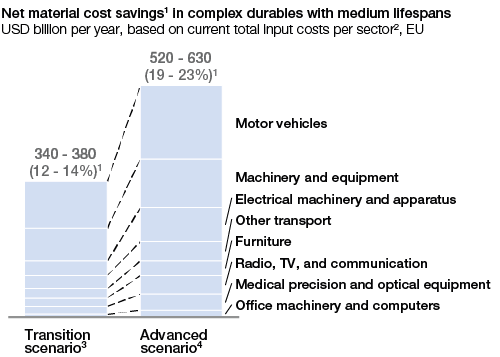 23 McKinsey iron ore cost curve, Ellen MacArthur Foundation Circular Economy team in: Towards a Circular Economy 2, p. 85.